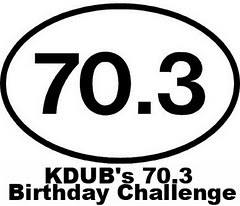 Today Mike and I continued chipping away at KDUB's 70.3 Birthday Challenge. We finished the running portion on Wednesday ending with a half marathon time of 2:08. Today we got to work on the biking and swimming portions. We ended up spinning away for 20 miles with a final time (for me) of 1:17. Mike finished around 1:06. That wasn't all though. After stretching we hit the pool and swam 1,000 yards in 19 minutes. The swim portion is complete with a final time of 44 minutes and we only have 26 more miles to go for the bike portion. I think we can do it! 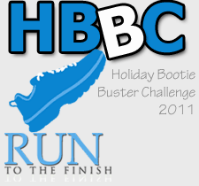 I wish that today's workout counted toward the Holiday Bootie Buster Challenge (HBBC), but yesterday was the last day. Overall, I really enjoyed this challenge set up by Amanda at Run to the Finish. It held me accountable and I would always feel guilty when I skipped a workout. I just wish that I hadn't been injured at the beginning of the challenge! My best week was the last week. Even without doubling my running points for doing Amanda's Virtual Resolution Run (a bonus to HBBC participants), I still would have had 37.4 points! Most of my points were from running or walking. I also earned points for stretching, swimming, spinning and doing Jillian Michaels 30 Day Shred DVD. I earned ONE point the entire challenge for eating 7 fruits/vegetables in a day, I need work on that. I'm sad that HBBC is over, but there are always fun challenges going on in the blog world. I found Just Trying is for Little Girls' New to You Cross Training Challenge. 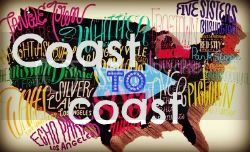 The general gist is to try 12 new (to you) cross training activities the entire year. Every month must have a new activity and it only has to be done one time! Sounds easy enough to me. I know that one of my new activities is going to be Turbo Kick, I just have to decide when I want to do it. Part of the challenge is blogging about the new activities so you will all get to follow along! Do you like participating in challenges? Any suggestions for new cross training activities? I haven't participated in any challenges, yet! But I'm hoping to in the new year! Ok, there is a Boxing Gym near my house and I have been wanting to try and real Kickboxing class. I haven't been brave enough to try it by myself. Thanks for sharing about the New 2 U Challenge, I'm working on linking everyone up right now. Turbo Kick sounds difficult. Can't wait to read all about it. you rocked the hbbc!! I kind of quit the last two weeks but only really because I forgot to chart my numbers! You did great on HBBC. I enjoyed that challenge too, but also disappointed on my F/V intake. I've got a little swim and big bike to finish up on the 70.3 challenge. Totally liking that one since swimming is the new "cross-train" for me this month. And wow, you swim fast! Jess - We have an advantage though, I was on a swim team from 8 years old until my second year of college and my husband did it for a little bit longer than that. We also joined a Masters swim team for about 6 months a few years ago but then stopped since it was so expensive. I love challenges! I've actually barely logged my points of HBBC. I just have a hard time getting into a routine of logging things. And as for cross training, does ice skating count? That's all I do when I'm at school. Although zumba is fun. Rena - Ice skating definitely counts. I haven't ice skated in so long and I'm actually afraid to! I haven't done zumba so that could be another option. The HBBC was the reason I lost weight this holiday season! I'm doing a Biggest Loser challenge with my local tri club right now and didn't have a great week. I like the short, quick ones the best - like virtual races that make sure I get out there and knock out 3 miles I might have skipped otherwise.